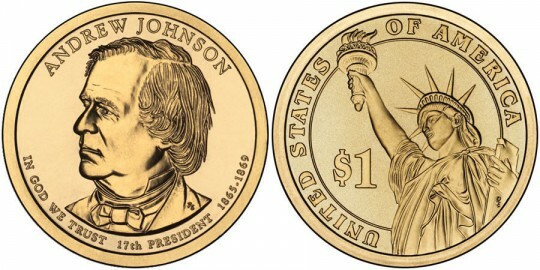 The 2011 Andrew Johnson Presidential $1 Coin will be the first strike in 2011 released by the United States Mint as part of its Presidential $1 Coin Program. This coin honors the seventeenth President of the United States who assumed the office after the assassination of President Abraham Lincoln. He had just recently been elected to the position of Vice President owing to his strong Union views despite being a Senator from a Southern State. After the assassination, Johnson led the country for four years over-seeing the reconstruction of the Confederate States of America after their surrender from the American Civil War. His actions were not without controversy, however, as his Republican base did not support his consolatory attitude towards the South. Don Everhart designed and sculpted the portrait of Andrew Johnson that is featured on the obverse of the coin. Surrounding the portrait are the inscriptions of "ANDREW JOHNSON," "IN GOD WE TRUST," "17TH PRESIDENT" and "1865-1869."